Varna originated in Vedic periodThe most unique thing about Indian society is its caste system, to some it’s very simple way to stratify the society but to other it’s complex to understand its institutional dynamics it’s. Some equate caste with colour of skin other term it with Varna meaning clan, still others finds its moorings in the pursuit of occupation. 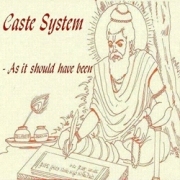 The origin of caste system in India could be traced to the Vedic period when the Aryans immigrants from the northern region came and settled in the Indus and Gangetic regions around 1,000 B.C. Historical records mentions that with the beginning of cultivation by the Aryans the earlier word "gavasthi" meaning search for cows came to mean 'to fight for cows', because fights between the various tribes of Aryans for fertile land and herds of cattle became common. Once the Aryans settled as agriculturists they developed the society on division of labour having different occupations. Even though it had further stratification, the grouping was essentially four-fold; Brahimins, Kshatriya, Vaishya, and Shudra. The priestly community elevated themselves to the status of Brahmins. Those who were fighting were known as Kshatriyas. Those indulging in trade and business were called Vashyas. Interestingly it was during the Aryan stay in the Saraswati region that emergence of new class Vaishyas took place. Sudra priest The people among the three communities were Aryans the natives were pushed to the bottom of the society and were called Sudras. The concept of purity and pollution emerged with the Aryan settlement. The non-Aryans and mixed-Aryan were dub as Sudras. Among them some were forced to undertake unclean occupations like cleaning of the carcasses, removing night soil etc. They were called as Dasas and Panis. Aryans who claimed supremacy over the natives maintained distance from the Sudras. Historical evidence from sixth century B.C. onwards reveals that the Sudras were primarily drawn from non-Aryans and mixed-Aryans. This is borne out from the fact that King Ashoka enslaved one and-half lakh people after the Kalinga war and brought them to the Gangetic region to cut forests and cultivate land. 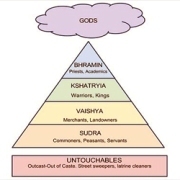 community OF SudraDuring the Mauryan rule the caste system developed based on occupation. This period also saw Brahmanism becoming ritualistic that was marked by elaborate ceremonies by the priestly class. The Aryan rituals and festivals became more pronounced and elaborate and sacrifices rituals were being practiced. The priestly class tried to assume power and created the legend of Manu. 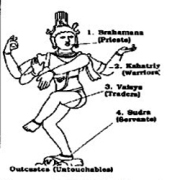 According to it all kings were adjudged as descendants of the ninth Manu, while Brahma created the first Manu. There emerged 61 schools of religious thought and among them were Buddhism and Jainism that confronted Brahmanism. As a result Brahmanism lost ground due to the opposition from these new faiths. Since Vaishyas were not accorded a respectable status in Aryan society, they became Jainis and Buddhist. Royalty too changed their belief. Bimbisara, Chandragupta Maurya (probably a Jain) and Ashoka became Buddhist. They patronized new heterodox sects which tried to simplify life for the common people. New class VaishyasThe subsequent period saw the emergence of more rigid form of caste system in which more communities were added as sub-jatis. Fa-Hien, a Chinese Buddhist monk from Chang'an, travelled to India from 399 to 414 CE records the presence of a well-established caste system. He clearly mentions the presence of untouchables and makes the observation that untouchablity was institutionalized.